Try Velographic Decals - http://www.velographicdecals.com/ Vintage and Custom Bicycle Decals. Mike Swantak has made numerous bike decals (vinyl transfers) If he does not have your model's graphic designs on hand, he can work from customer-supplied photos Email: mswantak@comcast.net. I only rode this bike a couple of times because my husband bought it for me while I was pregnant (what was he thinking?!) I never got into it. 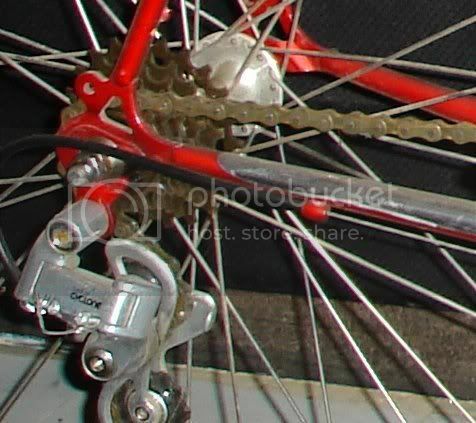 Now I would like to sell this bike, which looks practically new. 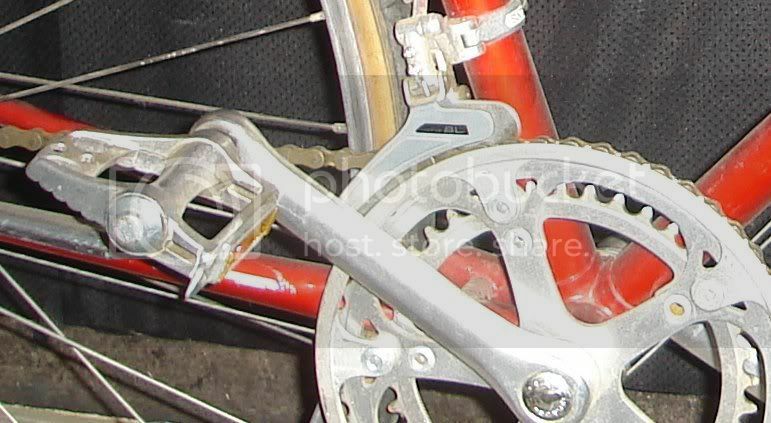 I have the original owner's manual, receipt, and sheet about the SunTour derailleurs that came with it. Any idea what it is worth or how I can find out? I had them put metallic red Bluemell's (spelling?) mudguards and a kickstand on it when I bought it. The receipt says "tourist bars (saddle too)". I haven't measured anything on it, but I'm short. I can measure everything if someone is interested. I have a bright green Schwinn that I bought new around 1982 or so. I'm really not that much into bikes and haven't ridden it much. I took it to a car swap meet a few years ago just to ride from place to place, and several people, who apparently recognized it, thought I was a bit crazy for riding it around! I thought I'd try to do some research and see exactly what I have. It has no model name on it anywhere, and the only place it says "Schwinn" is on a small round decal on the seat support tube. It has a large white reflector in the front and rear spokes and on the front of the handlebars and on the rear brake caliper. It has bright green wrapping on the handlebars, and it is a 10 speed. I seem to remember ordering it because I am a big guy. It might be a 27" frame? I don't know where to look for the serial number, as it's not real obvious apparently. Any information on what this might be would be appreciated...thanks. Hey. 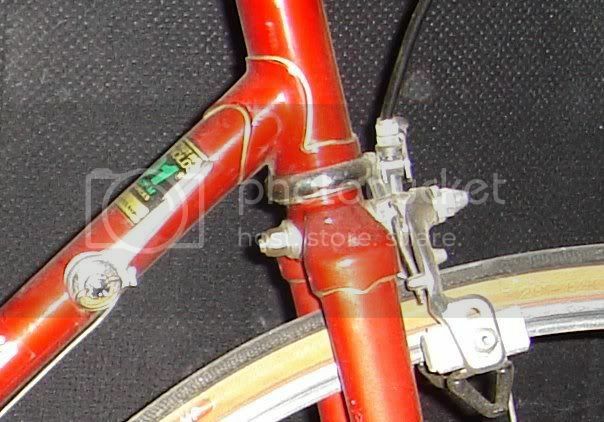 The reflectors are a good indicator that the bike is not one of Schwinn's true racing models. But there are still many who value lower-end Schwinns for their cool factor, so its value may still be decent. If it wasn't a Schwinn it probably wouldn't have much value. 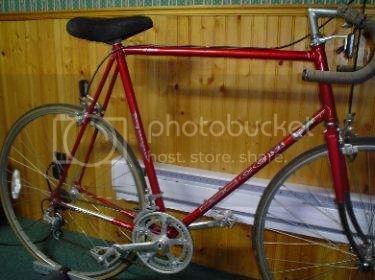 OK.....got the word from the Schwinn forum after posting a pic. It's a Varsity, built in Feb of '80. Does anyone know anything about high-end CCM road bikes built with Reynolds 501 tubing? It has Suntour Cyclone gears. I'm anxiously awaiting it's arrival. I'll know alot more when I get my grubby little hands on it. I have this pic for now. The bike supposedly has a sticker on it saying "made in France". I thought that all CCMs were built in Canada. I'm getting the bike with a bunch of others(all CCMs) Not really interested in the value. More just information because I'm a serious CCM collector. I like to document everything and when I come up with an anomally I need to figure it out. It's part of the charm of collecting. I probably research my bikes more than I ride them. (lol) I try and ride all 39 vintage CCMs(at some point) to keep them fresh. The worst thing you can do to a bike is let it just sit for long periods. They are bikes and need to be ridden. Thats a bizarre bike. Older CCM Flyers and the Tour de Canada were made with 531. I can't make out the details in the pic. And I'm quite sure they weren't made in france during the Suntour years. The sticken was maybe taken off of another bike perhaps? Here's a close up of rear drop out and derailler.